I’m arriving late to the FabFilter party, but I did bring an AudioCube. It’s super easy to map AudioCubes to FabFilter plug parameters. Just hit the plus sign, add a “New MIDI Source” for each cube face you want to be a modulation source. 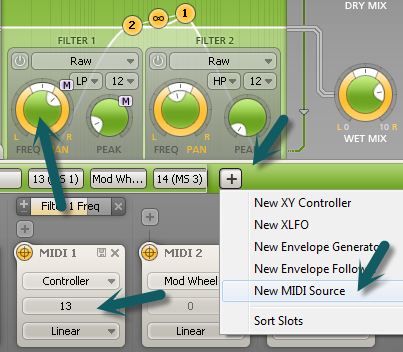 Set the source to “Controller” and match the MIDI CC setting the face is programmed to in MIDI Bridge. Then map the controller to a destination – like Filter Freq. Image below illustrates this Timeless 2. What Will U-He Announce at Musikmesse 2013? In case you missed the email that went out yesterday. Meet up is been moved to next Wednesday due to snow storm.